This is a very large industry world wide, second only to ceramic tile in clay and energy use. The knowledge of how to make sanitary ware can be found on every industrial continent. Although alot of it is made in China (e.g. Chaozhou is a small city in Southern China that has hundreds of sanitary ware factories) many other countries have very highly developed processes and innovative products (we are impressed by many in the middle east). Most sanitary ware is fired at high temperatures from porcelain bodies resembling the standard 4x25 recipe (feldspar, kaolin, silica, ball clay) and is glazed using zircon opacified feldspar based recipes. 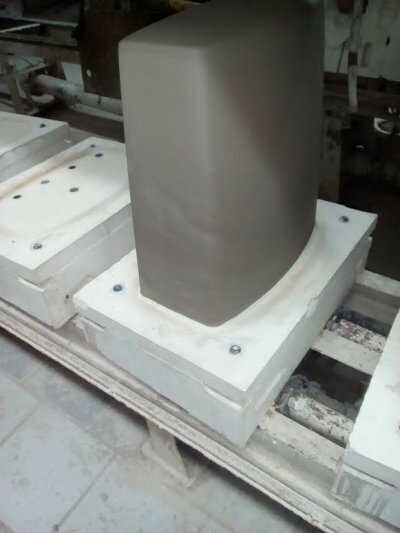 The manufacture pushes many ceramic processes to their limit (thick casting, high mass drying and firing, thick glaze layers, highly deflocculated slips, etc.) and thus experience much product loss. Many of the factories in the third world that make sanitary ware are less automated but still very dependent on supplier technical support (they do not have technical people on staff). Most of the requests we get for technical assistance come from these types of companies. Example of the oversize particles from a 100 gram wet sieve analysis test of a powdered sample of a porcelain body made from North American refined materials. Although these materials are sold as 200 mesh, that designation does not mean that there are no particles coarser than 200 mesh. Here there are significant numbers of particles on the 100 and even 70 mesh screens. These contain some darker particles that could produce fired specks (if they are iron and not lignite); that goodness in this case they do not. Oversize particle is a fact of life in bodies made from refined materials and used by potters and hobbyists. Industrial manufacturers (e.g. tile, tableware, sanitaryware) commonly process the materials further, slurrying them and screening or ball milling; this is done to guarantee defect-free glazed surfaces. The original recipe had a very low clay content, sourcing almost all of its Al2O3 from feldspar instead. Although the glaze slurry was maintained at 1.78 specific gravity (an incredibly high value) and thus would have had very low shrinkage, it did not stick and harden well enough to the ware. Why? Lack of clay content in the glaze. The fix was to source much more of the Al2O3 from kaolin instead of feldspar. 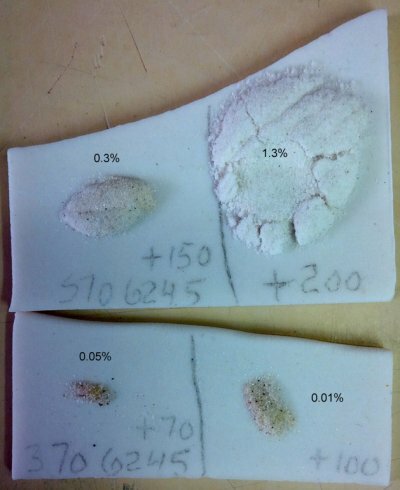 The reduction in feldspar shorted the glaze on KNaO and SiO2 so these were sourced from a frit and pure silica instead (the calculations to do this were done in Insight-live.com). The change also provided opportunity to substitute some of the KNaO with lower expansion CaO. This reduced the thermal expansion and reduced crazing issues. This sanitary ware tank lid was made in China. 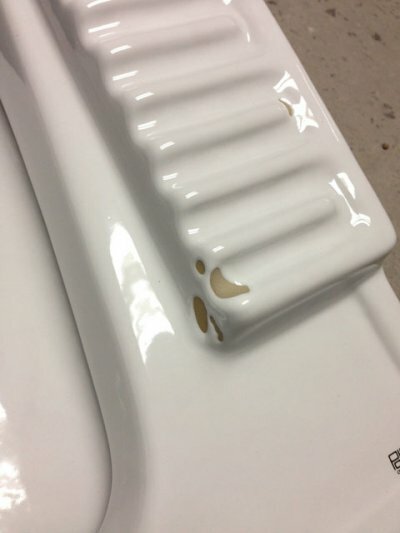 Notice how thick the white glaze is being applied to cover the iron containing body below. 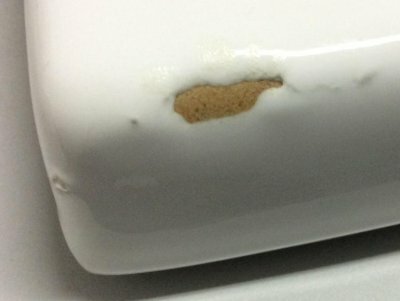 This is a testament to how opaque a zircon opacified glaze can be. Of course, high percentages create a stiffer glaze melt and conditions can more often combine to produce crawling like this.